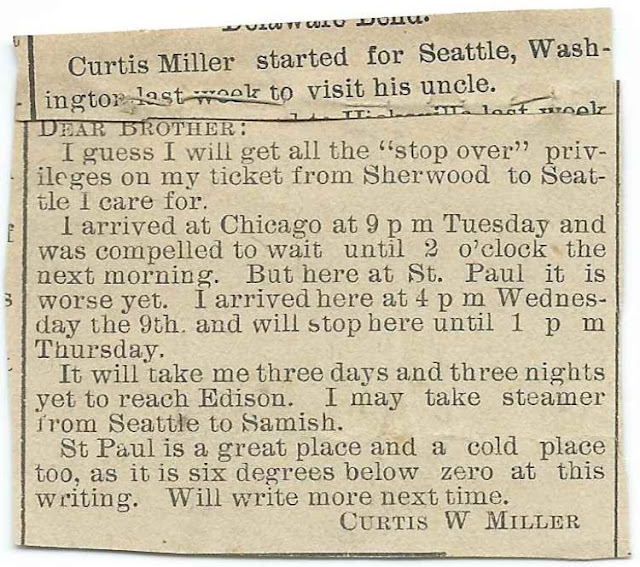 Newspaper clipping featuring a March 10, 1908 letter Curtis W. Miller wrote to his brother about the frustrations plaguing Curtis during his trip from Sherwood, Ohio, to Samish, Washington. The date appears where the clipping has an unfortunate crimp. Transcription at the end of this post. The clipping was found tucked in the Bible of Jeremiah Bloom & Susanna (Snyder) Bloom of Pennsylvania and Ohio; passed on to their son James Hagan Bloom. James' second wife, Louisa E. (Miller) Bloom, was the aunt of Curtis Weston Miller, presumably the letter writer above. Curtis Weston Miller was born November 16, 1877 at Delaware Township, Ohio, the son of John J. Miller and Catherine Rebecca (Miller) Miller. About 1903, Curtis married Esther Syvilla Simmons; they had several children. Curtis, who had a shoe store at Sherwood, Ohio, died in 1944. Syvilla died in 1946; they're buried in the Sherwood Cemetery at Sherwood, Ohio. Curtis Miller started for Seattle, Washington last week to visit his uncle. I guess I will get all the "stop over" privileges on my ticket from Sherwood to Seattle I care for. I arrived at Chicago at 9 p m Tuesday and was compelled to wait until 2 o'clock the next morning. But here at St. Paul it is worse yet. I arrived here at 4 p m Wednesday the 9th and will stop here until 1 p m Thursday. It will take me three days and three nights yet to reach Edison. I may take steamer from Seattle to Samish. 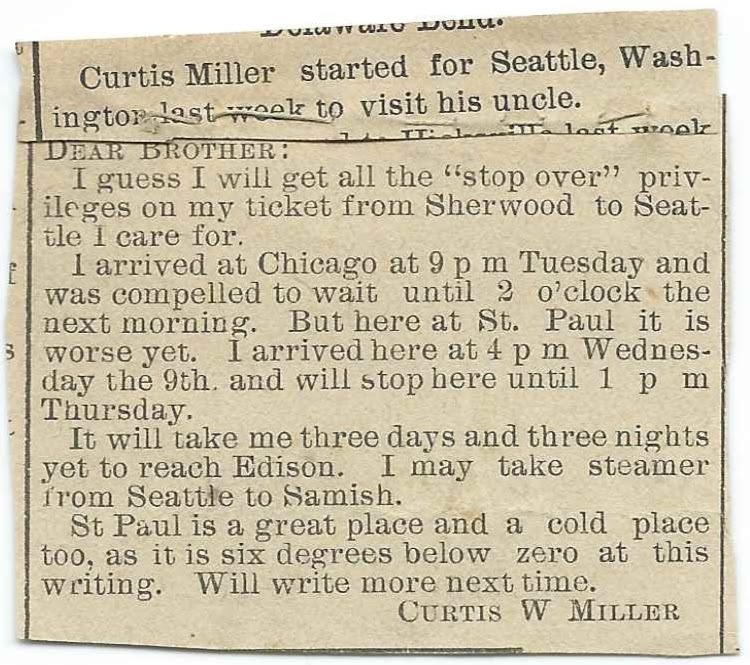 St. Paul is a great place and a cold place too, as it is six degrees below zero at this writing. Will write more next time.